The elegance of engineered wood provides the basis of the Timber Trussed Arch. The dynamic curves of a glued laminated arch are subtly complimented with steel and hardware. Tall enough to provide clearance under the overhead bracing, the design invites people to pass through and experience the complex engineering. Intended for recreation applications, the design is in accordance with AASHTO standards. The bridge will handle typical maintenance traffic and traditional railings make it practical for trail use. 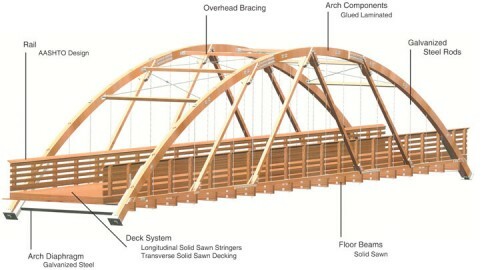 As with other bridges provided by Wheeler, the timber is selected for performance and economy. Durability is ensured by treating with appropriate preservatives and all hardware is hot-dipped galvanized. The Timber Trussed Arch makes your project everyone’s destination.